In 1995 the director of MIT’s machine shop for the Artificial Intelligence Laboratory (Robotics Group) made ten videos, totaling more than seven hours, that teach students how to use machine tools. They show how to set up and do basic machining operations on a mill, lathe, drill press and other common shop equipment, but they do not include recommendations about cutting speeds or feed rates because students are expected to look up that information on their own. The instructor generally does an excellent job, but even seven hours is not long enough for all the material he tries to cover and there are some shortcomings. 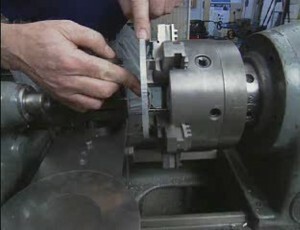 For example, he could have shown a better technique for setting the height of a lathe bit, and the segment where he covers thread cutting on a lathe is almost useless. Yet I was surprised to find that he also includes, and does a good job, showing some more advanced techniques, like using double-side tape to hold parts too thin to be held in a milling vise or lathe chuck. I have added the times when many of the segments start but I have not had a chance to do that for all of the videos yet. Great videos ! Great help! Very informative videos,learned things I did not know. Watch some over and over..